The design was inspired by Linda Snyder of Linda Snyder Associates, Inc. 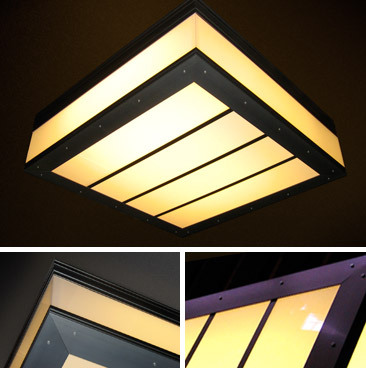 Initially created for Marriot Hotel, the Cubx is a sleek enclosed box of illumination. Cubx work well grouped in large spaces, as well as along hallways and corridors. Cubx frames come in a variety of metal colors and are covered in a translucent white panel allowing light to emanate from the top as well as the sides. They measure almost 6 foot square and extend off the ceiling approximately 22”. The light source is typically standard florescent fixtures but also can be fitted with cold cathode or LED. They can be mounted or hung from ceilings, attached to walls or placed freestanding. Cubx is a very bold look, available in a variety of sizes and frame finishes.